Hear ye, hear ye! Greetings and salutations! Welcome to your new EarthQuaker Devices Organizer! The Organizer is a Polyphonic Organ Emulator which uses up to five softly modulated octaves to recreate the olde-timey sounds of vintage drawbar organs and rotating speaker effects, with a little bit of the elusive “Guitorgan” tossed in for good measure, but without all the extra woodworking and cabinetry. The Organizer’s analog circuitry gives it a warm sound and feel, with a touch of Leslie warble that’s unlike other modern octave shifters, but its DSP processor is razor sharp so it can track chords (as well as single notes) perfectly all the way up and down the neck on guitar and bass. But why stop there? Try it on vocals, synths, horns, drums, or anything that needs to get Organizized one of these days! We’ve done away with all the complicated motors, drawbars, pipes, and levers, and whatnot of thy traditional organ setup, and in its place installed a super simple six-knob control interface. The Organizer’s mixer section contains controls for Up, Down, Choir, and Direct, to adjust the blend of the octave voices. Up adjusts the octave up volume, Down controls the octave down level, and Direct sets the level of your analog dry signal. When the Up and Down controls are in use, the Choir control regenerates the octaves for an additional two octaves up and two octaves down! From there, the Tone control adjusts the treble contour of the effected signal from bright and chimey to soft and dark. The Lag feature delays the effected signal for anything from a slight octave doubling effect, to timewarping polyrhythmic octave blasts! 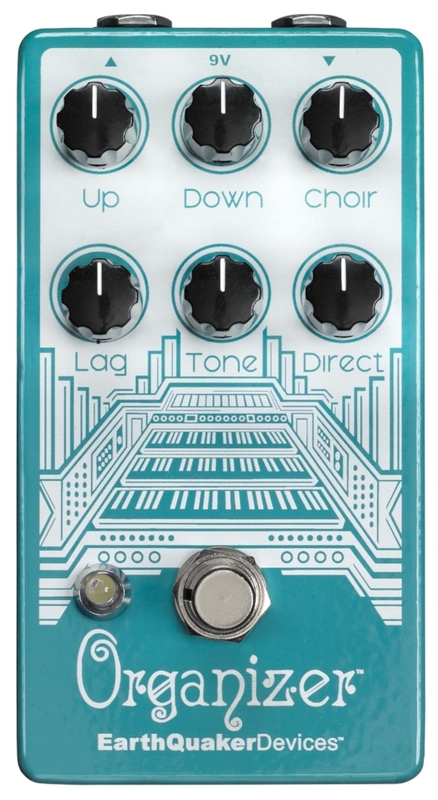 The Organizer uses true-bypass switching and has an all-analog dry signal path. Each and every Organizer is made by hand by card-carrying members in the secret society of Akron, Ohio. The Tentacle is a classic analog octave up effect. It is the very same octave from our beloved Hoof Reaper pedal. We got so many requests to make this a stand-alone unit that we just had to make it a reality. You can now add an excellent, swelling octave up to anything your heart desires!